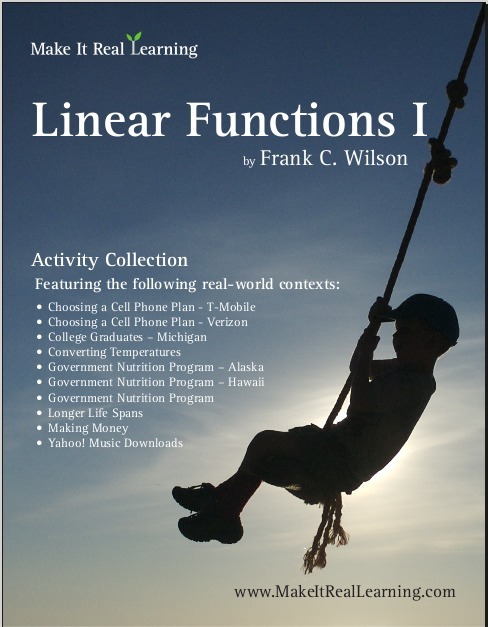 The Make It Real Learning Linear Functions I workbook focuses on real-world situations that may be effectively modeled by linear equations. This book is suitable for both algebra 1 and algebra 2 students. Whether choosing a cell phone plan or downloading music, learners will discover how to use linear functions to help them become better informed consumers. Each activity integrates real world information, companies, and issues (e.g. Yahoo!, T-Mobile, life spans, WIC, making money), not just "realistic" data.